If you’re like me you probably have every foreign auto company’s exact URL for your country memorized. This easy shortcut allows for the bypassing of those annoying “Select Language/Region/Country” pages you find on the international website. In the US this is fairly easy, with it more-often-than-not being some combination of [company name] and then “usa”. Notable examples include bmwusa.com, mazdausa.com, jaguarusa.com, landroverusa.com, audiusa.com, maseratiusa.com, nissanusa.com, and others like porscheusa.com are just a convenient shortcut to the US-specific website which uses a slightly different URL. Now this is a bit of a tangent but not every company follow this pattern. Many drop the “usa” and will just send you straight to your country’s website with a generic URL (if you’re in the US or UK at least) rather than the international page. Try out toyota.com, vw.com, and lexus.com. Some variations like vwusa.com or hondausa.com will not work at all while others will just redirect to the global URL. This is how it is for American domestic manufacturers too. But not every company follows these pattens. The hilarious nissan.com is a complete exception. Others like Honda, Mitsubishi, and Volvo require you to navigate to automobiles.honda.com, mitsubishicars.com, and volvocars.com/us respectively. But what about companies with long names? Surely typing in “mercedes-benz.com/usa” would be tiring and time-consuming for us obese and busy Americans. That’s why Benz’s American URL is simply mbusa.com. This is easy and fast to tap in, as I was trying to do other day when on my way to the S550 convertible configurator. But alas, I suffered a turn of fate. With a simple slip up I had instead typed “mbsua.com” into the address bar of my browser. Where did this sudden turn of events take me? To Mercedes Saudi Arabia? To Mercedes San Lucia? Mercedes Sudan? Mercedes Suriname? Nope. 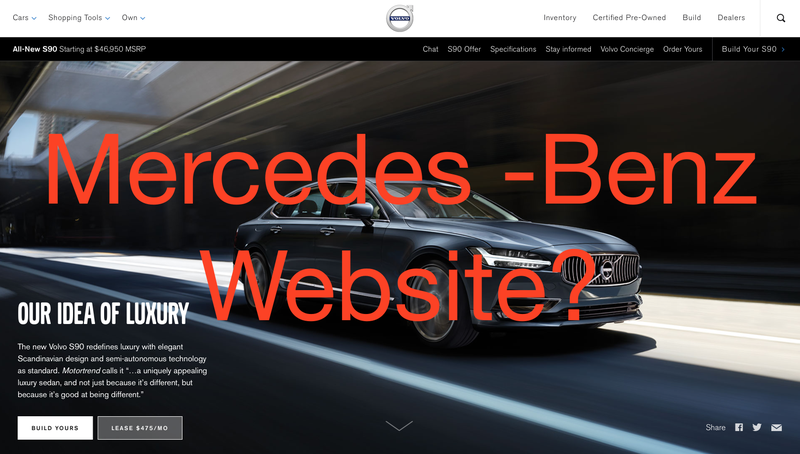 It sent me through a bunch of sketchy redirects that ends at volvocars.com! Perhaps someone with some expertise in internet/network protocols, SEO, internet advertising, or just website IT could disect the exactly mechanism of the redirects by which this phenomenon operates, but it probably isn’t worth their time. Actually let me correct that: it definitely isn’t worth their time. Anyway, someone at Volvo is being very sneaky. Another weird one is that dodgeusa.com takes you to Edmunds.com. I’m sure there are more strange redirects to find. And if you’re wondering: yes, this is how I spent my lunch break.